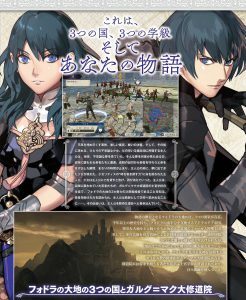 As promised earlier, we have some new Three Houses information courtesy of Famitsu! The latest issue of the influential Japanese gaming magazine includes 6 pages to introduce readers to the game, ahead of its 26th July release. 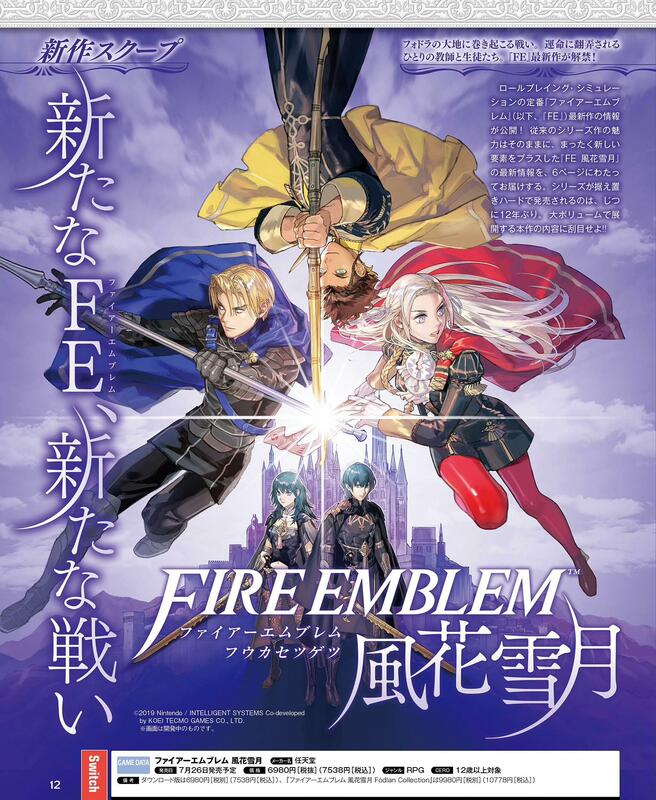 The first page shows off the game’s key art, which you’ve probably already seen before, on the game’s box art for example. The rest of the page has stuff you already know about or don’t really need to know. 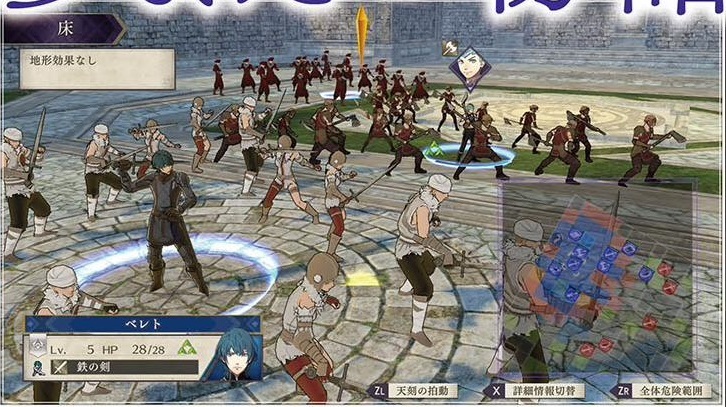 The screenshot near the middle seems to depict Byleth once again leading the Black Eagles (as Caspar is visible). 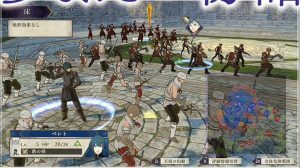 Of note, there’s a slightly blurry mini map in the bottom-right corner that seems to show 10 playable (blue) units. Byleth currently has 4 Movement. Below the mini map are three button prompts. ZL triggers Skyrending Pulse (more on that later), X toggles the detailed info display and ZR enables the Danger display (every enemy’s attack range at the same time). Below that is a blurb about the continent of Fódlan, but it doesn’t mention anything we didn’t know already from Nintendo Direct trailer. Summoners, we have a problem! A group of Heroes were enjoying an innocent picnic when a disruptive vortex suddenly appeared. 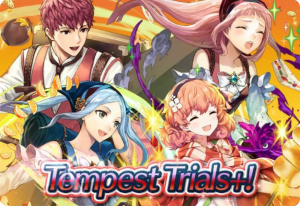 If you want to restore their smiling faces, you’ll have to tame the new Tempest Trials+: Taste of Spring. 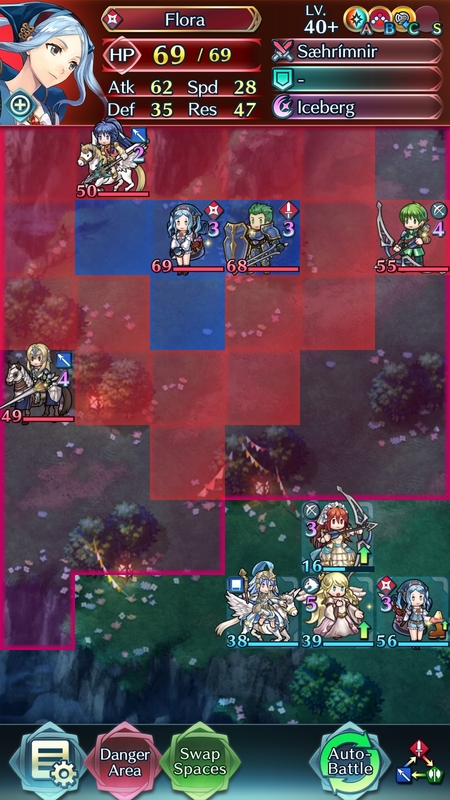 The maps in this Tempest Trial are pulled from Book I Chapter 11 and Chapter 12. Wow, that was ages ago… You can click here to view the final map (highest difficulty). The boss is Flora and she’s pretty deadly–be careful of her Armor March too! As well as a bountiful amount of Orbs and other trinkets, you can earn a 4-star and 5-star copy of Leo: Extra Tomatoes (green-tome cavalry), Wind Boost 1, Even Res Wave 1 and Chill Atk 1 Sacred Seals. To get the rewards quicker, you’ll want to field at least one of the eight Bonus Allies. 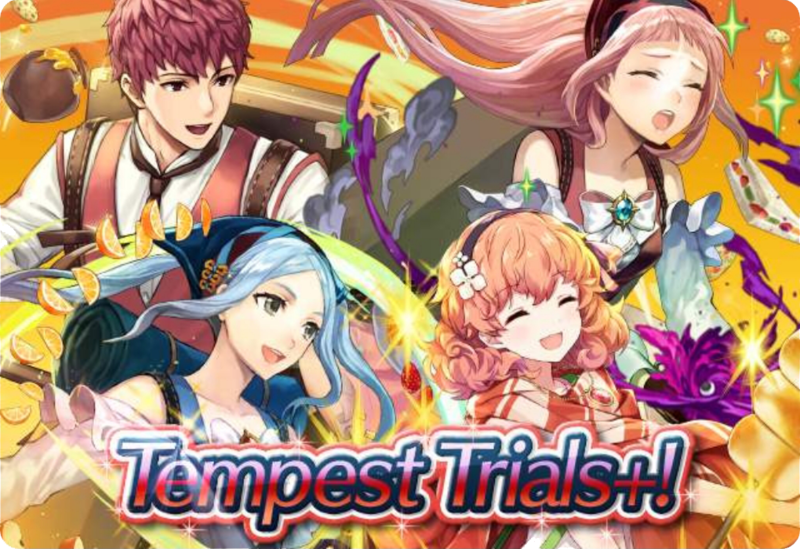 The top four are from the latest new summoning event, A Season for Picnics, while the last three can be summoned from the Tempest Trials banner. If you don’t have any of those seven Heroes because you’ve been unlucky or are hoarding your Orbs, you can grind a bit to earn Leo and use him as your Bonus Ally. Leo also has Distant Def 3 (4-star) and Quick Riposte 3 (5-star) in case anyone wants him for lunch. The Tempest Trials runs for 10 days, ending after the daily rollover on 4th May 2019. Fire Emblem Heroes is running another skill-based banner to try and part you from your hard-earned Orbs: Heroes with Iceberg. This time, the focus Heroes are Flora, Selkie and Innes. Obviously, all three Heroes come with the Iceberg skill, which boosts damage based on the unit’s Res stat. All three Heroes are also pretty cool (sorry!) 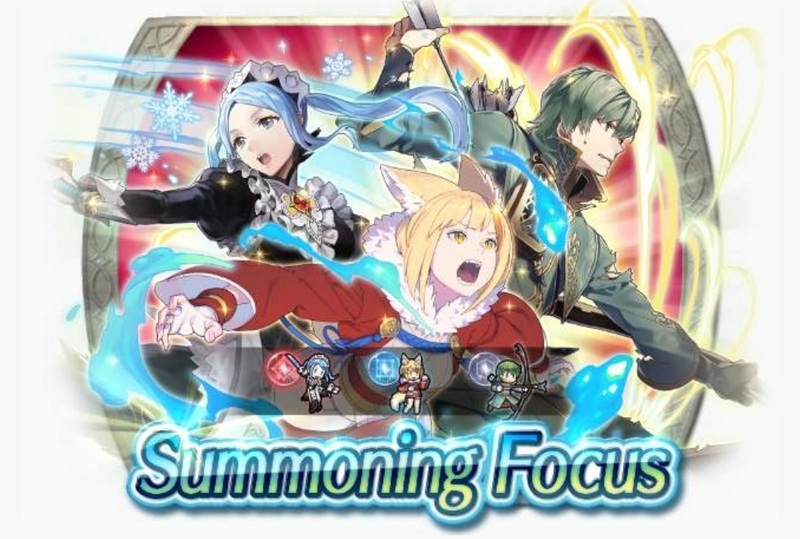 in their own rights–Flora punishes foes with Distant Counter, Selkie has a busted Beast kit and Innes can refine his legendary weapon. The Heroes with Iceberg banner is good until the daily rollover on 5th May 2019. 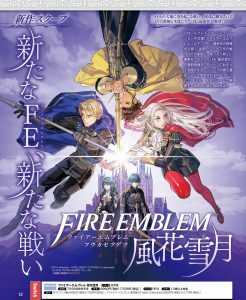 Famitsu, one of the most notable Japanese gaming magazines, has teased brand new information for Three Houses in their 16th May 2019 issue, which comes out on 25th April 2019. They also mentioned that they’ll have more information about the game in future issues. Featured is a preview image for presumably the first double page spread. Unfortunately, these images are always tiny and no amount of CSI enhancement can reveal what most of the page actually says. We’ll just have to wait until the issue is actually out. 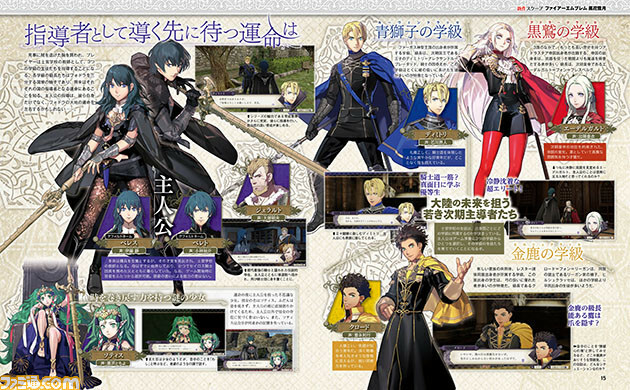 That said, we can clearly see the official artworks of male and female Byleth, Sothis, Dimitri, Edelgard and Claude, which are all completely new. There also seems to be information for each character’s Japanese voice actor (including Jeralt’s). Another thing: male and female Byleth’s names are spelled slightly differently in Japanese: Bereto (male) versus Beresu (female). However, both seem to be valid spellings of “Byleth”. Perhaps in the English version, the female version might be called Bylethe or something? On a related note, it’s really hard to see, but I believe there’s a note above both male and female Byleth’s names, which says “default name”. This strongly implies that the player can choose Byleth’s name, similar to the Avatar in previous games.